ree and easy-to-use tool to pack attachments in Microsoft Outlook. Fast and safely compresses attachments in messages, contacts, tasks, calendar and journal items. Packed attachments reduce the size of PST / OST storage files and improve Outlook performance. Compressed attachments in mailboxes and Exchange Server public folders speed up message loading process and increases the overall messaging system efficiency. Working with attached archives provides more features: ability to open blocked attachment types is just one of them. Placing executables inside the archives eliminates the possibility of accidental .exe launches. 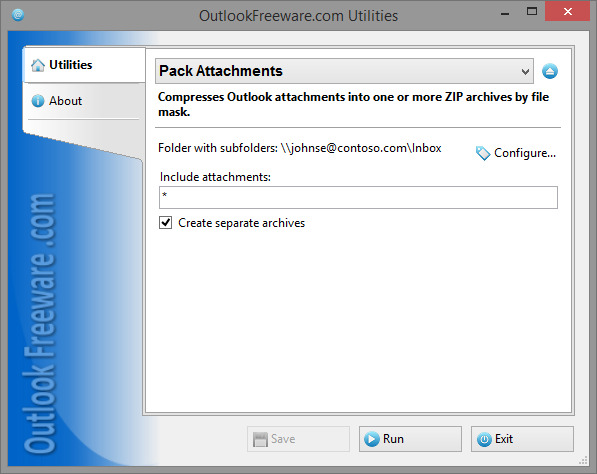 The utility packs attachments to ZIP archive and removes original files from Outlook elements. Several attachments can be compressed to the one common ZIP file or to a separate archive for each of the attachments. Attachment name patterns can be specified for selective compression. For instance, only Microsoft Word documents can be packed by specifying *.doc* pattern. Tight integration with MS Outlook enables packing attachments of selected elements, folders or even whole storages. Standalone launcher allows to compress attachments without need to have Outlook running.